Using graphic symbols rather than realistic pictures we can produce intricate designs and layouts using our computer and laser engraving machines to produce control panels, mimic panels and schematic diagrams. 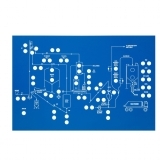 We can supply a schematic diagram of an chemical or manufacturing process using symbols to represent the tanks, vessels, piping, valves, pumps and other equipment of the system, emphasizing their interconnection paths using colours. In an electronic circuit or wiring diagram we can engrave the layout so that it will be easily interpreted by the viewer. In a large factory or office there may be a need to display zone areas for fire alarm control panels which can be engraved and colour coded. 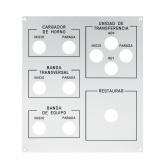 We can supply control panels for electrical cabinets.